Cook sausage and drain on paper towels. Set aside. Place English muffin cubes in 13 x 9-inch casserole dish and drizzle with the melted butter. Layer sausage, cheeses, onion, and red pepper over English muffin cubes. In a bowl mix the eggs, milk, salt, and pepper. Pour over cheese mixture in casserole dish. Sprinkle with bacon bits. Cover the dish with saran wrap and place in the refrigerator overnight. 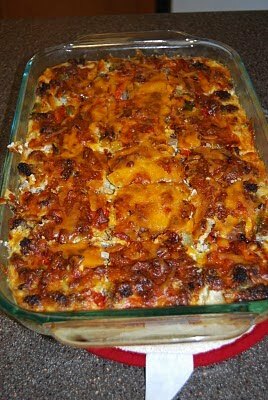 Remove casserole 30 minutes prior to cooking. Remove saran wrap and bake at 350 degrees for 40-45 minutes.